One of the best reasons to read the boating tips we often share on this site courtesy of the About.com Powerboating Guide is that the Guide's author, Ericka Watson, is a former active duty U.S. Coast Guard captain, and she has really seen it all when it comes to dangerous boating mistakes. Her boating tip today sounds pretty basic at first glance… "carry more flares on your boat." 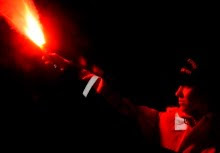 But instead of just preaching (like we usually do) about carrying more flares, Ericka shares a true story from her experience in the Guard where a bad situation was made worse by some inexperienced boaters that got into trouble and had only one flare. Read the instructions carefully when you first buy your flares so you don't have to learn how to use them in an emergency situation when every second counts. Great safety tip. Thanks for passing it along. Another great reason to bring along extra socks is because if you lose power on the boat bottled water can still be kept cool by placing the bottle in a wet sock and then putting it in a breezy spot.